Charles Howorth (United Kingdom, fl. 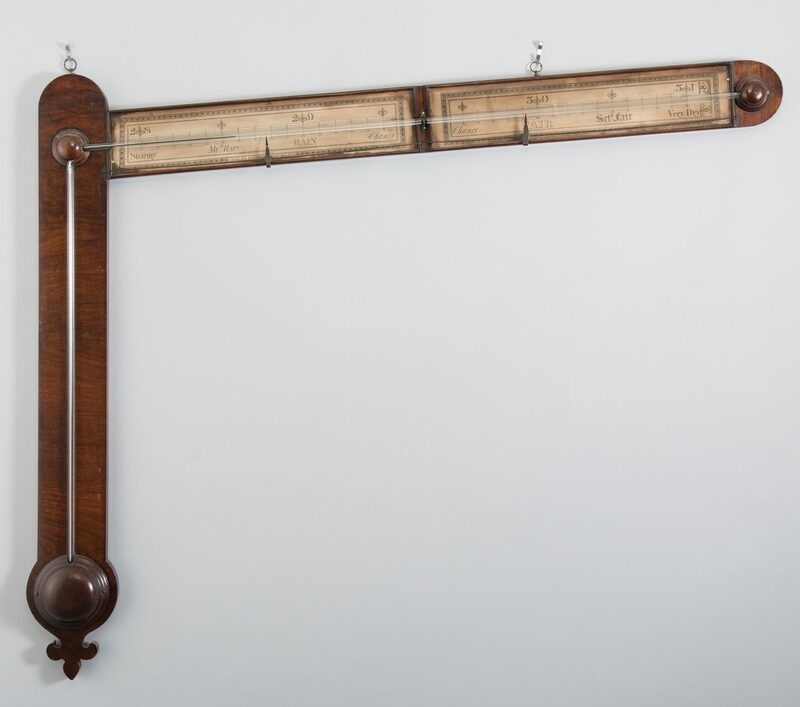 1823-1852) mahogany angle or sign post barometer. Two printed paper scales, under glass, on extended arm registering from "28 Stormy" to "31 Very Dry." Glass tube continues down left side to enclosed cistern, with mahogany case terminating in a carved stylized lotus or fleur di lis. Signed "Charles Howorth Fecit Halifax" and "Stott Sculp" lower middle edge of left glass case. 38" H x 46 1/2" W. 2nd quarter 19th century. CONDITION: Lower glass thermometer replaced. Tear to paper of first scale, 1 1/2" lower left. Water damage around edges of paper scales. Cracks, marks to mahogany. In working condition.